Ladies College and Royal College emerged National Schools ( under 17 ) tennis Champions at the SLTA courts yesterday beating Visakha Vidiyalaya 2/1 and Ananda College 2/0 in the finals respectively. Ladies, the defending Champions, defeated Ave Maria 2/1 in the semifinals and Visakha beat Holy Family Convent 2/1. Earlier Ave Maria had beaten last year’s runners up Bishops College to enter the semifinals. 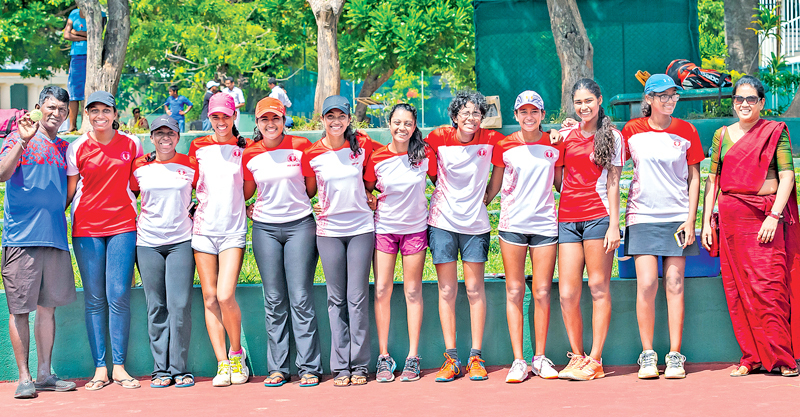 Sister’s Anika and Alana Seneviratne led the way for Ladies by winning all their matches and and successfully defended the title they won last year. Alana partnered Aindree Vairavanaden in the semifinals and Michela in the finals and they won the crucial 3rd ties in both matches to give Ladies College the Championships. For Visahka sisters Senuri and Tharini Alexander played well to help them to reach the finals. Royal won the Nationals after a long lapse and beat St Thomas’ College 2/0 in the semifinals and Ananda 2/0 in the finals. In fact it was a clean sweep by them and the team comprised of Kavisha Ratnayaka, Tehan Wijemanne, Dilvan Herath,Manish De Silva , Anul Deerasingh and janith Munasinghe.